and here come the years all rushing in at you. Sometimes we know this and sometimes we don’t. This poem, "Dear Amy Nehzooukammyatootill," by Aimee Nezhukumatathil (a terrific found poem made from emails the poet received from high school students!). I love how it highlights the intriguingly strange and unintentionally funny language of the emails, but isn't at all snide/condescending). Praying Drunk, by Kyle Minor (from Sarabande Books). It is so, so good. More on this later. This very charming article and project, "Twitter by Post," by Giles Turnbull. Turnbull recreated Twitter through snail mail....what a great and fun idea! It's interesting--I've always loved mail and have enjoyed making an event of it (in college I'd go to the post office almost every day to check my P.O. Box or send something out....I remember my friends and I asking each other, "Shall we go to the post?"). I hadn't really thought about the connection between social media and mail before....it's an intriguing one! Also...next week, I shall be in Seattle for AWP14. I'm especially excited about hosting this event (also featuring Nick Courtright, Leah Umansky, Luisa Igloria, and Justin Runge---woohoo!). I shall report back, and will likely see some of you there! This week, in the Professional Writing class that I teach (for art students), we were discussing social media. I've also been talking with my mom about this, as she's been setting up her Etsy shop for her cards (check it out--it's called Slender Stalk, and it's beautiful!) and experimenting with social media. It got me thinking about why I have found it so valuable, and why I keep using it. Yes, it's fun, and of course, it's wonderful to connect with others who share the same passions. But it's more than that. Here are some thoughts on the topic. I'd love to hear yours, too! How can artists/humans benefit from social media? Social media is a space that folks must navigate, enter, and fill. It is a convention center. It is a train station. It is a street. Social media is a tool for communication (both sharing and listening). It is not a replacement for human connection. It is another way to speak to other humans. We do not need to use social media to live. Ideally, it can add to/enhance our experience of life. To some, it can feel overwhelming and detrimental. I understand this. We must remember that we are able to use or not use social media anytime we like--we control it (not the other way around). The purpose is not to sell work, to shout like the loudest infomercials about ourselves. We would not behave this way in public; thus, it behooves us to be mindful about our presence online. Online = in public. The point is never about getting numbers, sales, or recognition. Not every social media channel will be useful for us. We have to make decisions about which will be most helpful for our work and our lives. Also, we can use these channels differently from one another. An authentic voice (discussing real passions, thoughts, and both good and stupid ideas) will resonate with interested listeners. We can be silly, deep, thoughtful, irritated, inquisitive as we express ourselves. Social media allows us to open our studio to the public. Even if we don’t have a studio. 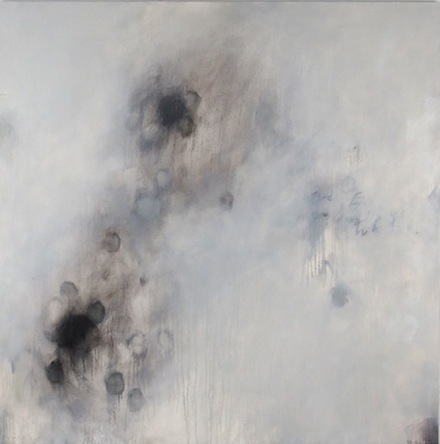 It allows us to visit other artists’ studios and have discussions about what we make. Social media furthers our art and our thinking about art. It can be a good excuse to take our own art seriously (if we do not already). A crucial part of being an artist is supporting the creativity and art of others. Social media allows us to be a champion for people and ideas that we believe in. Social media can help us find a generous, supportive community (to which we must bring a generous, supportive presence). Social media is about connection. What if social media (like art) could help us become more open to the world and the place of the self here? What if it (like art) could help us to be more present? I think it can. I can’t imagine a more fitting book to enjoy right now (in the icy tundra and snow days that many of us are currently inhabiting). 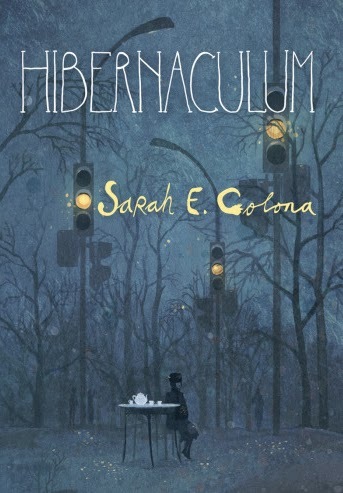 Hushed and reverent, mysterious and playful, the poems in Sarah E. Colona’s Hibernaculum want to share their quiet magic with you (and also to tuck you into bed with a dark fairy tale or two). NOTE: After the interview below, read “Now I Understand,” “The Custody of Ghosts,” and “Whispered into a Statue’s Ear,” all of which appear with the permission of the author. Order your copy of Hibernaculum here. Q: Silence and secrets appear in so many of the poems in Hibernaculum. As a writer, how do you view the quiet, the whispered, and the unsaid? How do you decide what to say or not say? How does secrecy work in your poems? A: Thank you for the opportunity to discuss my work, Hannah. I’ve never outgrown an early fascination with storytelling: fairy tales, myths, parables, and family moments. In all stories, there’s a bit that remains untold. I remember listening to conversations held over my head. Like other children, my siblings and I would try to decode the adult world’s euphemisms and facial expressions. A teacher’s hitched brow could play like a sermon. Even at home, some truths were tucked away until maturity yielded understanding.